Is Diet and Regular Soda Bad for Your Brain? Habitually drinking several sodas on a daily basis can increase the risk of depression, according to a long term study sponsored by the National Institutes of Health. The NIH project surveyed over 260,000 people in 1995 and 1996, taking information on daily beverage consumption, including soda (both diet & regular), fruit drinks, and coffee. The NIH study then followed up with participants a decade later to determine how many had received a diagnosis of depression since the original study years. It turns out that study participants who regularly consumed four or more cans of soda per day had a 30% greater chance of developing depression compared to participants who did not consume soda drinks. A key point to highlight here is the almost quaint idea of having only a 12 ounce can of soda, which contains about 39 grams of sugar. 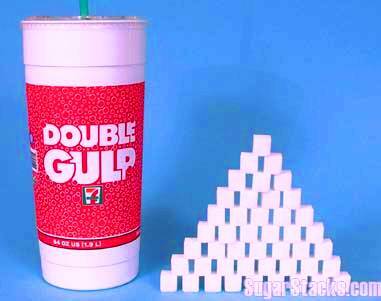 Most fast food soda drinks now contain around 38 ounces (128 grams of sugar), and double Big Gulps contain a whopping 50 ounces (160 grams of sugar). In other words, super-sizing one soda drink is the same as drinking four regular size cans of soda. There is a direct link between high levels of sugar consumption, diabetes, and obesity. It follows that depression can be part of this spiral. So what about drinking only diet sodas every day? The research evidence points to the possibility that using “fake” sugar like saccharin and aspartame alters the food consumption feedback loop between the body and brain. When your brain can’t tell the difference between real and fake sugar, it discounts the importance of any sweet food, which can encourage higher food consumption levels. Read more here. As with most things, moderation is a virtue. Drinking a soda on an occasional basis is fine, drinking the equivalent of 4-5 cans of soda every day probably isn’t. On the positive side, the NIH study indicates that drinking four cups of coffee each day may provide a modest defense against depression. Study participants who drank four cups of coffee daily had a 10% less chance of depression compared to non-coffee drinkers. See also This is Your Brain of Fat and Sugar.